Gichin Funakoshi had an idea. Upon arriving in Japan from his native Okinawa, he would demonstrate his brand of karate only before intellectuals. He reasoned that learned men, relying on brainpower as opposed to brawn, had come to neglect their bodies. Doctors, attorneys, university students, and artists of every stripe became the hand selected audience for Funakoshi's inspiring demonstrations and lectures. Funakoshi asserted that anyone who put in the time and effort could develop a karate physique, as he called it. That was one of his main selling points; to get in shape, and to reap the benefits of health and physical well-being through rigorous training in karate. Japan (c. 1920) was beginning to catch up to the West as a nation of advancement and technology. The white collar class there had begun to emerge, and thus Japanese men of that time had become less physically active than their predecessors. Karate, it seems, found a new home in Japan, and had arrived in a timely manner. Funakoshi was hardly the first to advocate a fitness oriented regimen for a scholarly group. According to legend, the Zen master Bodhidharma arrived in China around 500 AD, settling at a Buddhist monastery known as the Shaolin Temple. Dismayed and surprised at the poor health of the residing monks, he prescribed exercises to strengthen and condition their atrophied bodies. Over time, these exercises became more structured and systemized, developing into self-defense applications. 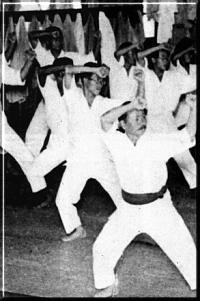 This gave rise to chuan fa, or more popularly known as kung fu. Tai chi, one of the world's oldest martial arts, is generally practiced today for its health benefits. Ultimately, the purpose of martial arts training is to strengthen all three human components: mind, body, and spirit. I have never linked it all before.. but I can see the history of wimpy unfit people joining karate, and gaining in health through this article. Fascinating! I agree with you that trophies and colored belts do not demonstrate proficiency. A person who is in the martial arts just for the belt and/or trophy isn't a true martial artist, in my opinion. They may as well go to the store and buy their black belt. One famous example of a "wimpy, unfit" individual who gained in health through exercise and eventually martial arts was Theodore Roosevelt. Some styles are actually opposed to competition for that reason. Other styles (such as Wing Chun) don't award colored belts.